The susceptibility of Tennessee’s Appalachian Mountains to anthropogenic stressors has remained largely uninvestigated likely due to a lack of known point source contamination. However, a growing body of scientific evidence suggests that depositional inputs can lead to concerning levels of contamination, even in remote areas. To investigate potential concerns, water quality parameters, contaminants in water (nitrogen, TSS, and metals), and contaminants in eastern brook trout (mercury, polychlorinated biphenyls [PCBs], organochlorine [OC] pesticides, dioxins, furans, and phthalates) were measured in four Appalachian Mountain streams from 2015 to 2017. 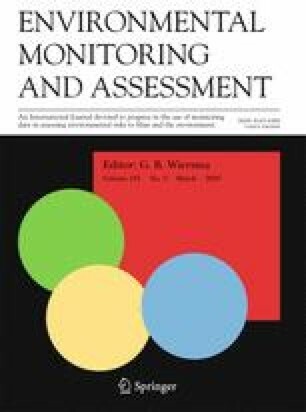 Concentrations were compared to literature and/or model-derived (e.g., biotic ligand model) threshold values to determine whether levels exceeded those acceptable for stream health. Dioxins and furans were detectable in fish tissue at all sites with an average 2,3,7,8-tetrachlorodinbenzodioxin toxicity equivalence (TEQ) of 0.0015 ng/kg. Concentrations of PCBs, phthalates, and organochlorine pesticides were never above analytical quantitation limits, although several OC pesticides (e.g., alpha-chlordane) were detectable in fish. Aluminum concentrations in water were found at levels shown previously to cause mortality in brook trout during acidic rain events. The average whole-body methylmercury concentrations in fish among sites were 0.037 ± 0.003 μg/kg and were on average 75 ± 2% of total mercury. Connor I. Olson and Gale B. Beaubien were co-first authors. The online version of this article ( https://doi.org/10.1007/s10661-019-7305-7) contains supplementary material, which is available to authorized users. This work was conducted as part of The Tennessee’s Ecologically At-Risk Streams (TEARS) project, a multiagency effort designed to establish current contaminant levels and the susceptibility of headwater streams in Tennessee’s Appalachian Mountains. We would like to specifically thank Amber Hills, Jaylen Sims Andrew Todd, Will Collier, Jim Habera, Rob Lindbom, Matt Landis, Matt Kulp, Jim Herrig, Susan Lanier, Luz Maderal, and Bob Read for aiding with site establishment, sampling, and analytical logistics. We thank Richard Martin for providing geological surveys. A special thanks to Adam Ryan and Bob Santore of Windward Environmental for providing and running the BLMs used in this study and Eric VanGenderen for guidance on sampling design. All funding for this study was provided by the Tennessee Wildlife Resources Agency. Please contact the corresponding author, Ryan R. Otter, at Ryan.Otter@mtsu.edu for any data not provided as supplemental data.